ORPHEUS partner b<>com at NAB Show, 7 – 12 April 2018 (photo: b<>com). With around 100,000 attendees every year, NAB Show in Las Vegas is the world’s largest show focusing on media technology. 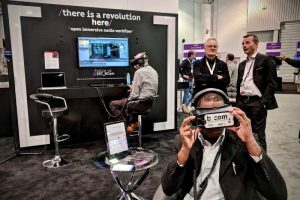 Already present in 2016 and 2017, b<>com had again a stand in the 2018 NAB Show Futures Park area where they showcased some of the production tools developed during the course of the ORPHEUS project. The demonstration presented by Nicolas Epain, audio research engineer at b<>com, took the visitors through the process of creating spatialised soundtracks for immersive media experiences, from production to distribution and playback. The first step of the demonstration focused on recording 3D audio scenes using a Zylia ZM-1 spherical microphone array. The microphone signals were converted into Higher-Order Ambisonic signals (HOA) and monitored using VST plugins developed by b<>com during the ORPHEUS project. The second step of the demo highlighted post-production and mixing for 360-degree movies using CinematicVR, a tool developed by the French startup Aspic Technologies. This tool allows to create immersive soundtracks consisting of audio objects, HOA and channel-based audio. The obtained soundtrack can then be exported in the Audio Definition Model (ADM) format. In the final step of the demo, visitors could experience two different immersive audiovisual experiences: “Alteration” by Jérôme Blanquet, and “Longing for Wilderness” by Marc Zimmermann. The soundtracks of both movies consisted of HOA compressed using the MPEG-H 3D audio codec.